The Sandy Point Shoal Lighthouse is located on the western end of the Chesapeake Bay, clearly visible from the westbound span of the Bay Bridge. The lighthouse, built in 1883, has suffered severe deterioration over years of weather and lack of maintenance. The beauty and majesty of this elegant yet functional maritime landmark deserves to be restored and preserved, and a major restoration project has been taken up by its current owners. This 3 story brick caisson style foundation lighthouse rises 51 feet high, with an octagonal mansard roof. The light is currently powered by solar panels. The original 4th order Fresnel lens was destroyed by vandals in the late 1970s, and the fog bell was stolen as well. The light now flashes white every 6 seconds and can be seen for 9 nautical miles. Sandy Point Shoal Lighthouse was added to the National Register of Historical Places in 2002. 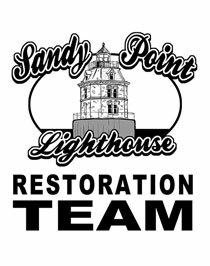 Check back for progress pictures on this exciting and important Sandy Point Shoal Lighthouse Restoration Project! 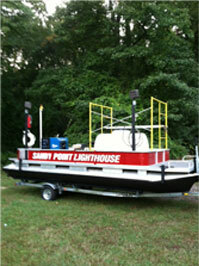 Friends of Sandy Point Shoal Lighthouse Donation Link Coming Soon! 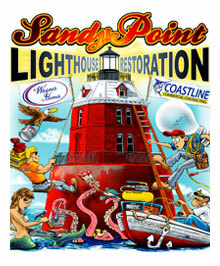 Copyright © 2013 Sandy Point Shoal Lighthouse. All Rights Reserved.